Welcome back to another installment of the exploration of the SovLabs modules! 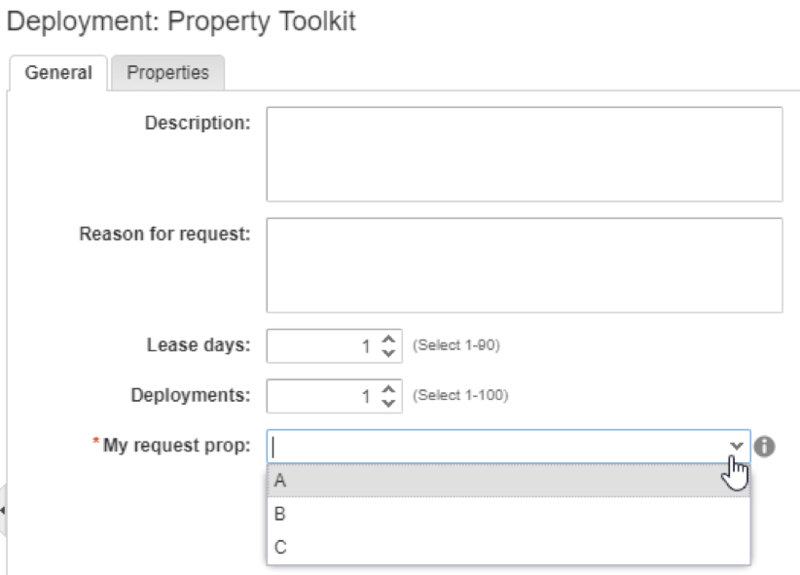 A while back, I went through and introduced the Property Toolkit module via a use case of dynamically building custom properties based on the presence of other custom properties. I illustrated this in the form of placement in vCenter folders. In this article, however, I want to dive into another feature of this amazingly powerful module: dynamic property sets. With dynamic property sets, you are able to set the value of one or more custom properties based off of the value of a reference custom property. In so doing, you can greatly simplify your request forms by having multiple values defined in the background based on just a single one that is manually chosen. Read on to see how this is accomplished. 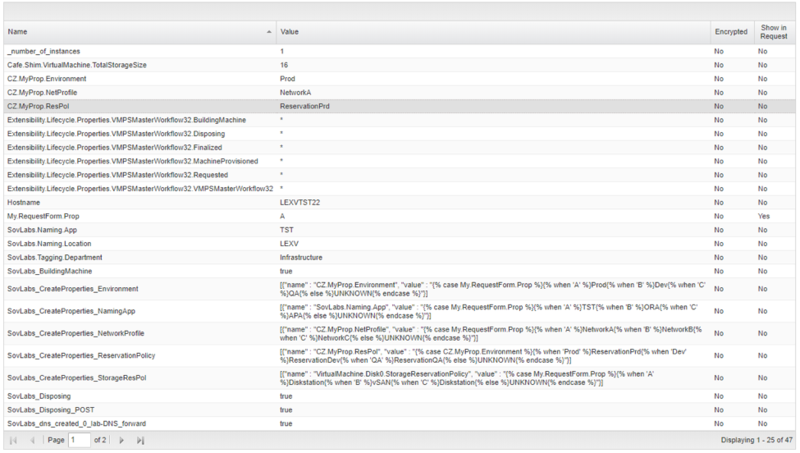 Custom properties (CPs henceforth) are the lifeblood of vRealize Automation, as many of those reading this know. They are a rich system of metadata which can influence not only the decisions made by vRealize Automation proper but also extensibility through vRealize Orchestrator. CPs are life, effectively, and one of the biggest challenges is managing those CPs and having their values set simply and without too much complexity. A common problem arises in the face of this which amounts to CP sprawl in a request form. When CPs are used for most major decisions, the user in the request form may be bombarded with a whole array of them which can slow down provisioning time, increase adoptability, and lead to user error (by virtue of incorrect selection in the form). Property Toolkit can help eliminate almost all of these through transparent, background, silent assignment of other properties. Environment. This sets the target cluster where the machine(s) will be built. Reservation Policy. Selects the right reservation policy (which can open up things like endpoint and datacenter). Network Profile. Sets the correct network on which the machine(s) will be attached. Name. 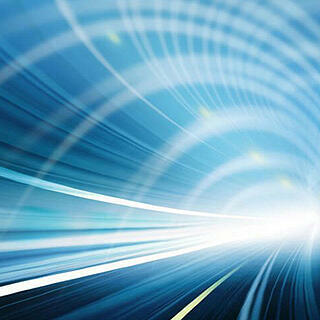 Provides part of the name in our custom naming standard. Storage Reservation Policy. Sets the storage which will be consumed. I’ll show this as a dropdown in the form. These values can be whatever you like, but I’m just using simple letters in this case for illustration. For example, instead of A, B, and C these could be application names like Oracle, JBoss, and Apache. 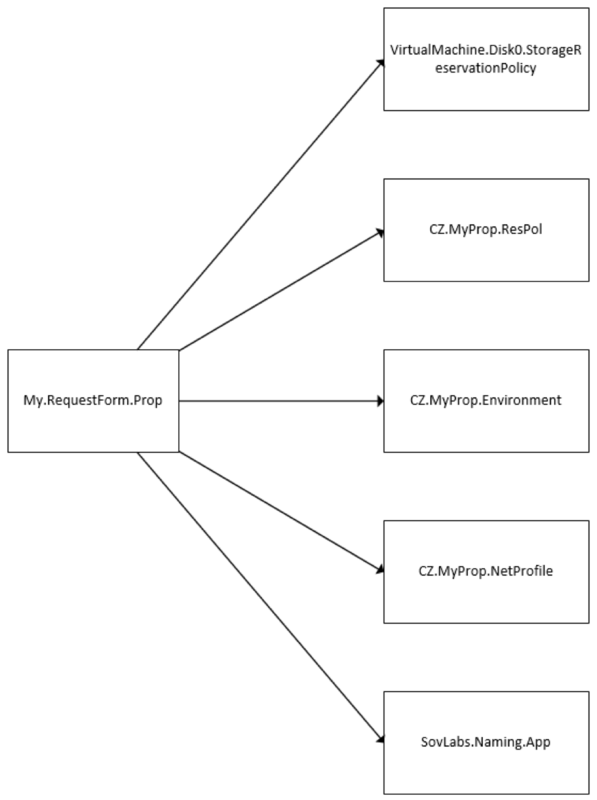 Next, I want to set the first of the dynamic properties, Environment, based on the value of My.RequestForm.Prop. The Environment CP will be called CZ.MyProp.Environment and the choices I have are Prod, Dev, and QA. I’ll map them one-for-one to the values you see above in My.RequestForm.Prop. In other words, if a user selects A from the list, then the value of CZ.MyProp.Environment will be dynamically set to Prod. It’s fairly straightforward. 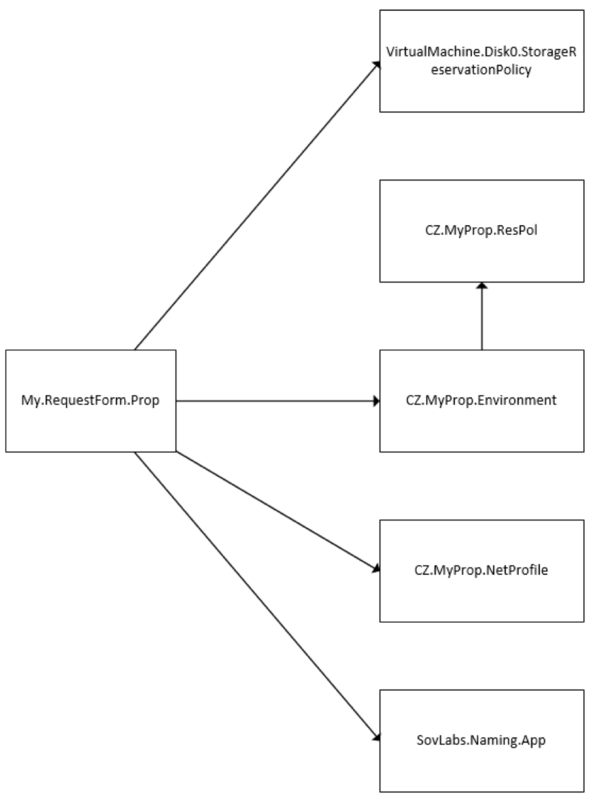 If the value set in My.RequestForm.Prop equals A then assign the value of Prod to CZ.MyProp.Environment. If that value is B then let it equal Dev and so on. Now we have that one, let’s define the others with the same basic statement. To simplify this, you can put them all in a single property group and attach that property group to your blueprint. To save time, I’ve drawn up the following table which shows the combinations. Effectively, then, the value of a single property (My.RequestForm.Prop) will influence the outcome of five other properties dynamically. Graphically, it can be represented as the following. If the value of My.RequestForm.Prop equals A then all the following values are set below it. If B, then all those in that column apply, etc. In this demo, I built a single property group and stashed all these properties there, although they could be in just a single dynamic property definition if you wish. as this must be set on the machine element in the canvas and not the blueprint level. If we flip over to the request form, we can see how simple this can be when presented to the end user. Let’s select A then deploy to see what happens. Based on the value A the Property Toolkit then set the 5 CPs we were after, including SovLabs.Naming.App which I am then consuming in another SovLabs module for Custom Naming (which produced the “TST” portion of the hostname you see). It got the correct Environment, it got the correct Reservation Policy, Network Profile, and it also went to the correct storage because this property, while on the machine element, still was able to be set from the initial value of A. So, this is cool, but let’s take it one step further. Let’s let My.RequestForm.Prop influence another CP, and then let’s let *that* value influence another CP. In this manner, we can create cascading dynamic property assignment. Here’s what I mean. And to put that in context with the other properties, the altered flow chart would result as the following. 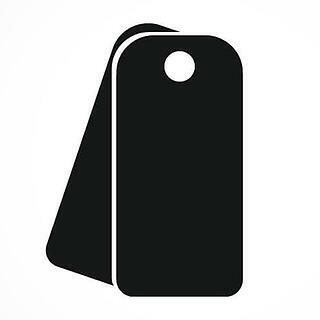 In order to distinguish, I’ll change the possible values of CZ.MyProp.ResPol from the table previously to be the following: ReservationPrd, ReservationDev, and ReservationQA. Now, let’s change the definition of CZ.MyProp.ResPol to key off of CZ.MyProp.Environment and not My.RequestForm.Prop. Let’s make the same request and see what happens this time. Amazing! All we’ve changed is the definition for CZ.MyProp.ResPol in this case and nothing else. Can you imagine the possibilities this opens up? The freedom, flexibility, and power the Property Toolkit enables your vRealize Automation to have is limited only by your imagination. To recap, then, in part one of the Property Toolkit series, we showed how it can synthesize new CPs based on the value of others. This was illustrated with the vCenter Folder use case. In part two here, we are creating dynamic property sets in which the value of multiple different CPs get their values from other CPs. We did this in two ways. The first was to assign five separate properties based on the value of one reference CP. The second was to cascade this logic by letting one equal another which equals yet another. In both cases, we achieved a dynamic assignment of various CPs even in different places by exposing just a single decision in the request form. 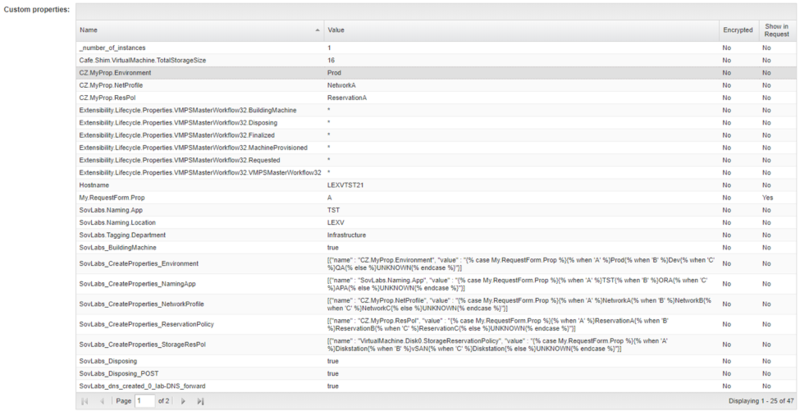 I really hope you’ve found this article to be helpful and that it has stirred your imagination with all the various ways you can use Property Toolkit to make your life simpler and your vRealize Automation much more powerful all while reducing complexity. It really is game-changing integration that opens so many doors all while eliminating the need to write, test, and maintain custom code. If you have any thoughts or comments about this article, please feel free to reach me on Twitter (@chipzoller).